If you still have questions after you've looked through these pages, please call the clerk who booked your appointment. Download our Outpatient Information Package here. Inside, you will find information for your appointment: Before you come, what to bring, what to expect, FAQs, planning worksheet. When we confirmed your appointment, we sent you a letter telling you what to bring. Be sure to read it because this page does not cover everything you may need for your appointment. toys, books, games - whatever will keep your child happy between appointments. You might want to bring a book for you, too! Some of the teams have other things they want you to bring. Please refer to your appointment letter, visit the Our Services pages, or call your booking clerk for more information. Please leave your valuables at home because we cannot keep them safe for you. During your child's appointment, both you and your child will be quite busy. If you have other children that you must bring to the appointment, please bring along an adult caregiver who can take care of them during the appointment times. We ask visitors and family members NOT to come into the health centre if they have cold or flu symptoms such as cough, runny nose, vomiting or fever. The entire grounds of a BC Children’s Hospital and Sunny Hill Health Centre for Children are smoke-free. This means that staff, patients, and visitors are not permitted to smoke in our buildings or on our grounds. You're one click away from quitting! QuitNow.ca is an internet-based quit smoking service that is available free of charge to BC residents. QuitNow.ca is operated by the BC Lung Association on behalf of the Ministry of Health. QuitNow by phone is a confidential quit smoking helpline available free-of-charge to B.C. residents. The service is open seven days a week, 24 hours a day, so that callers can get help when they need it most. Multilingual service is available. Developed with B.C. teens and available in B.C. high schools. For more information about Kick the Nic in your community, contact the Regional Tobacco Reduction Coordinator nearest you. Quit Smoking online resources from Health Canada. Sunny Hill is also pleased to offer a scent-free environment. Please do not wear perfume, cologne or aftershave when you visit us. Washing your hands is a great way to help keep you and your family from getting sick. Use lots of soap and warm water, and wash all over your hands. Rinse and dry your hands after. You can use our alcohol rub if you are in a hurry. During the day, Family Place is used by many parents and children who come to Sunny Hill for outpatient visits. A light lunch and snack menu is posted daily in the cafeteria. There are several vending machines that contain snacks and drinks in our cafeteria. If you would like to bring your own food, the cafeteria has two large microwave ovens and a toaster you may use. There are also some restaurants close to Sunny Hill if you have enough time to leave the campus. For long distance calls, please use the pay phones in the main entrances to the building. You may use cellphones in Sunny Hill because they do not interfere with our equipment. Please use cellphones away from the inpatient ward to avoid disturbing our children and families on the ward. Visiting hours at Sunny Hill are from 8:00 a.m. - 8:00 p.m. daily. You will need to check in at the Nursing Station on the 2nd floor before your visit. 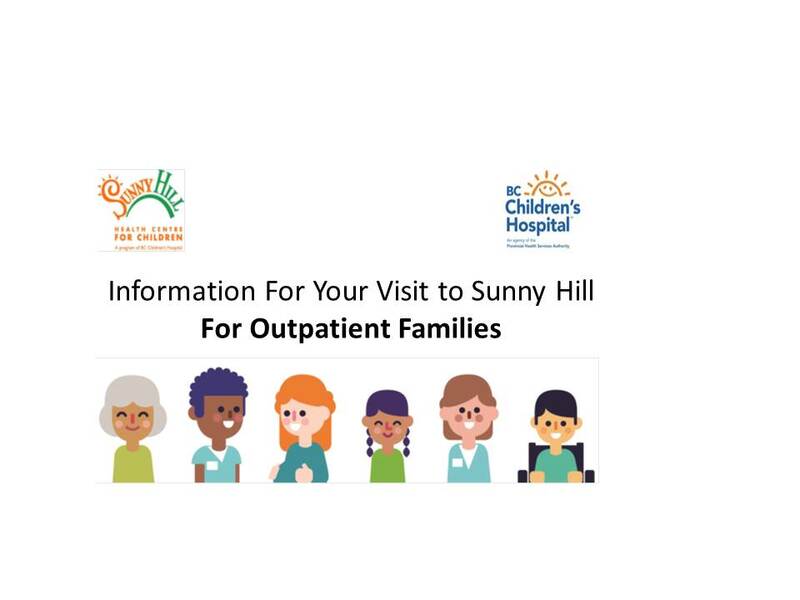 If you are planning an Inpatient stay, please see "A Guide to Sunny Hill for Inpatients and Their Families" and visit our Inpatient pages. The doors at Sunny Hill are locked at 6:00 p.m. on weekdays and all day Saturday and Sunday. If you are visiting during these times, ring the doorbell at the East 21st Avenue entrance.